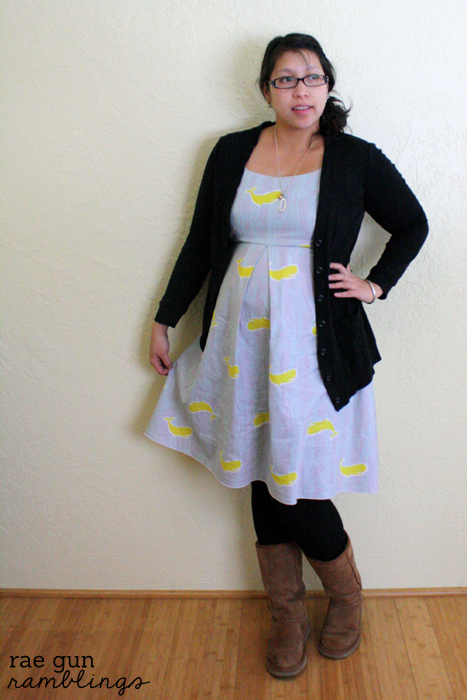 But today I’m excited to share what I sewed up for myself this month for Sew Our Stash that I do with Bev from Flamingo Toes! I love our little series that we do the last Thursday of every month. Before we started this I’d always stare at my fabric hoard and patterns and pins and think I should really sew myself but this Sew Our Stash has actually gotten me to do it. If you’ve been thinking the same thing I encourage you to add “sew for myself” to your new years resolutions. Seriously I’m SO happy that we do it! 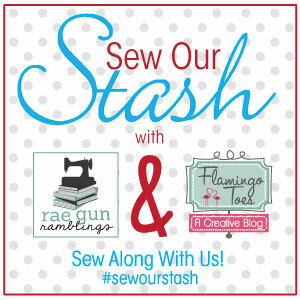 And remember that if you share pictures, process or finished products be sure to tag them with #sewourstash. 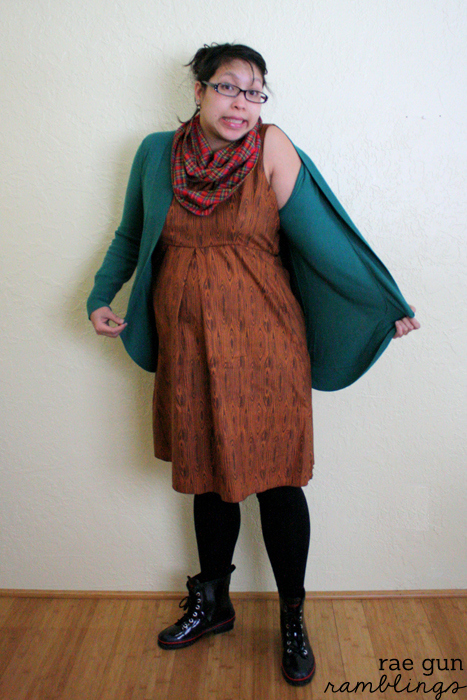 This wood grain dress is my Christmas dress for this year. 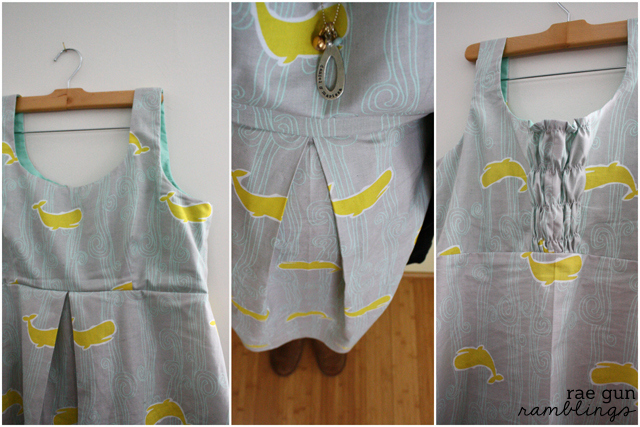 I have had an idea for a single pleat maternity dress for ages. In fact before I even got knocked up. When Susan of Freshly Picked had her Glam Lumberjack party and I couldn’t find a decent plaid sure I figured lumberjacks need wood to chop too. So I made this. 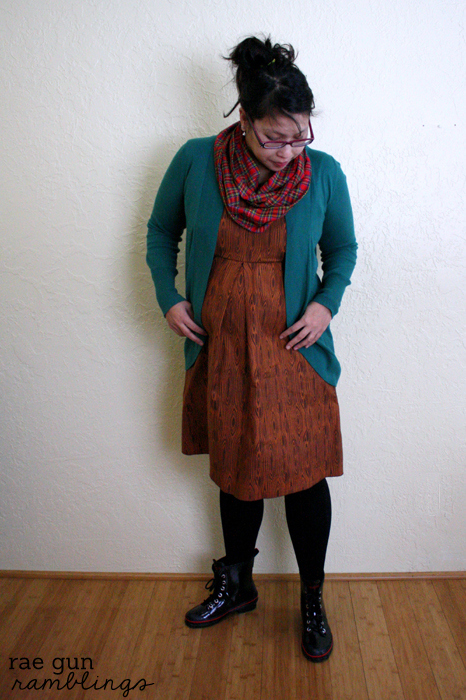 I’ve been wearing it with my Tartan Infinity Scarf that I shared the tutorial for last week and I love the combo. I am hoping it will still look fine without a bump but we’ll see. They are super comfy and easy to wear thankfully since even my maternity jeans have been bugging me these days. Also I did the back with some elastic so it can accommodate more stretch and I’m hoping look reasonable after Toasty arrives. I kind of showed how to do this in T’s Fancy Nancy dress tutorial. I’m pretty happy with how they turned out. I took process pictures so if any of you are interested in a tutorial let me know. 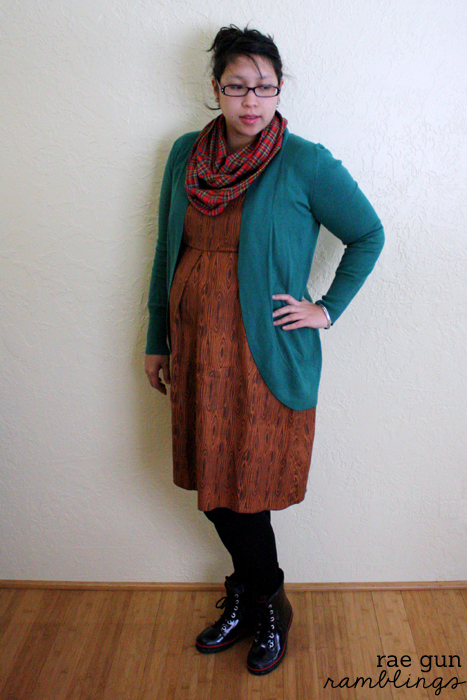 I think this would be a cute style on non-pregos too. And be sure to visit Bev at Flamingo Toes I know she has a fun Sew Our Stash today! I hope you’ll consider joining us in sewing more for yourself in 2014 you can see our progress before each post at our instagram accounts, Bev’s and Mine and others doing the same at #sewourstash. My sewing resolutions include sewing for me and learning more sewing techniques. Specifically zip flys for jeans. 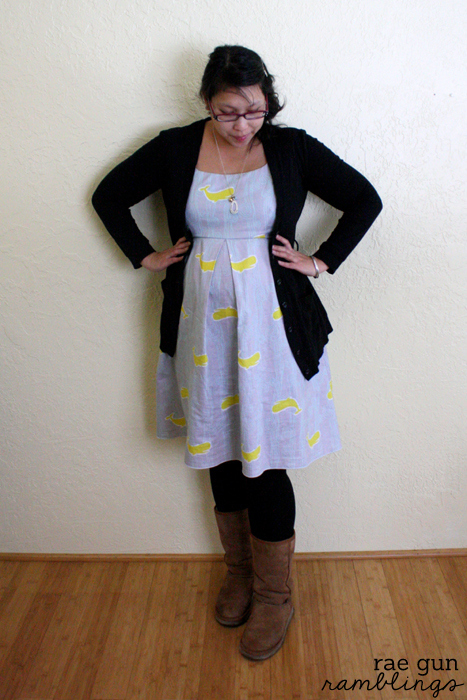 The problem is I get scared off when I fail, and my last women’s dress attempt was sad. My last two zipper fly attempts both ended up with buttons. Have fun with the nieces! I’m curious too. I’ll definitely report back. It’s a dress style/pattern from pre-bump so I’m hoping that will help but then again I DEFINITELY have gained more than just bump weight so I think it’ll be okay if they don’t fit ;) And learning more sewing techniques is on my list too. I tend to stick with stuff I am confident with and then make a bunch ahem like this post demonstrates haha. But I want to force myself to get better! You look adorable!! I love what you make. SO cute!!! You are so talented!! Cute dresses! You look really great too.